Born to Norwegian immigrant parents on May 17, 1918 in Port Alice, British Columbia, Arnold Gordon Gangnes received his formal education in architecture from the University of Washington, graduating in 1942. During school he served as an assistant instructor and worked as a draftsman in a variety of Seattle architectural firms including the offices of Lytel Shorett; Thomas, Grainger & Thomas; William Mallis; and George Stoddard. Upon graduation he was drafted and served in the U.S. Army Corps of Engineers achieving the rank of 2nd Lieutenant (1942-1944). 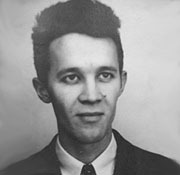 After the war, Gangnes entered graduate school, and received his master degree in architecture from Massachusetts Institute of Technology in 1946. After working in several offices on the east coast including the firm Anderson & Beckwith, Gangnes returned to the Pacific Northwest in 1947 and opened his own independent practice. Quickly Gangnes began to receive press and awards for his innovative designs of modern dwellings. In the late 1950s Gangnes began to receive larger-scale, non-residential and institutional projects. Notable projects include the Cherry Street Clinic (1958); a regional office building for the Waterfront Employers of Washington/Pacific Maritime Association (1959) in Seattle; a storage building for Abbey Rents (1960); the pro shop at Inglewood Golf Course (1961); Oxbow Industrial Park (1962); the Preferred Group Building (1962) in Bothell; an addition to Goodwill Industries (1964); Valu-Mart Stores, Midway site (1965) an Richland store (1967); an expansion of the Seattle Times Building (1968); and Villa-Mart Discount Department Store (1969) in Salem, Oregon. Involved in a variety of civic and social affairs, Gangnes served on the Seattle Planning Commission from 1946-1950, and was an active member of the Seattle chapter of the AIA, serving as its treasurer from 1953-1954 and on its Board of Directors from 1956-1959. He was most involved, however, in the Association for Retarded Children serving in various positions at the local, state and national levels. This included serving on the King County Chapter of the Washington Association for Retarded Children and the State Board of Directors (1952–1955); and was the longtime chairman of the Architectural Planning Committee of the National Association for Retarded Children (1954-69). In 1975 President Gerald Ford appointed Gangnes to the U.S. President's committee on Mental Retardation. Gangnes considered his work in the field his most important and he continued in such ventures for the remainder of his career traveling to throughout the U.S. and Europe as a consultant and lecturer on the topic of specialized handicap design. This included consultation with the state of Delaware authorities, conferences and lectures in Denmark, and France, and was a featured speaker at an international-symposium held at the U.N. Headquarters. Many of the projects were related to helping the disabled community. Notable designed include the Center for Disturbed Children (1960) at Western State Hospital in Steilacoom; Family Counseling Service offices in the Lowman Building (1967); three award-winning “Halfway Houses” for the Fircrest Hospital Campus (1969); and the Child Development & Mental Retardation Center (1971). Gangnes passed away in Seattle on April 21, 2003 at the age of 84.